See and feel the near casino quality of our custom ceramic pokers before you buy with a sample stack of ten custom chips. This will give you just enough to get the feeling of rifling thru a stack of custom ceramic chips. To expedite delivery, this sample ships via USPS Priority Mail (1-2 business days). 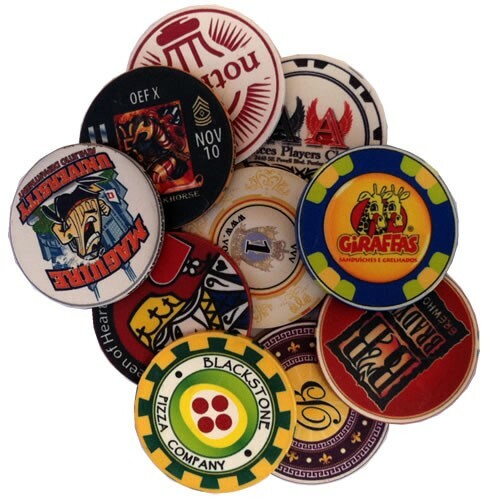 Our custom ceramic chips bring near casino-quality custom chips with permanently embedded graphics within the budget of most poker players. While our high-end custom clay chips run around $1200 for a 500-chip set, you can customize a 500-chip set of our custom ceramic chips for about 1/3rd that cost. The 10 gram custom ceramic line offers high-resolution graphics, full-color spectrum design capabilities, 100% customization on the face and rolling edge of the chip, and fast 2 week turnaround. See our FAQs on custom poker chips. Now that you’ve found the right chip to customize at the right price, sit back and let our world class illustrator create a design that’s worthy of a place at your next poker game. She'll email you a PDF mock-up based on your design instructions. Go back and forth via email as needed. Waited 3 weeks and never got my order. Was definitely a waste of time. I've known about Sidepot for over 10+ years. My husband is a huge poker player and I'm finally looking at getting a superior chip set for our house. The sample set (10 chips) re-confirmed there is no substitute for Sidepot, as I had ordered samples - but of a different kind - from Sidepot in the past. I'm looking forward to purchasing an ample-sized set later this year (for the holidays). Nice quality sample box. Gives a good idea of feel, weight, texture and overall appearance.